Fergus the Great is the historical person that the father in the Disney movie “Brave” is based on. In this book the answer to the origins of Fergus is answered in the continuing adventures of Dovsfield. Dovsfield is anointed by the Stone of Destiny at Tara to be high king of Eriu land. Immediately, he has to flee Eriu to escape from Coirpre, the current high king who wishes to kill Dovsfield. Then Dovsfield travels to Alba to seek refuge and help from Evenus, king of the Scotti. Yona knows of an ancient prophecy that she is to marry an Eriu prince. She loves Dovsfield and believes him to be that prince. Driven by her pride, she ignores the prophecy and chooses a different path across the Big Water to return to her tribe. 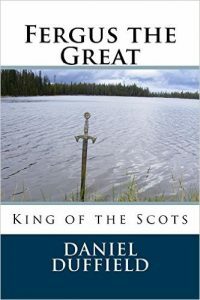 From Alba, Dovsfield returns to Eriu to lead a revolt against Coirpre with the help of a young priest named Patricus and a new kingdom called Dal Riata is born. It is in this new kingdom that prophecies are fulfilled and the destinies of all are determined. For those that missed the first two books in the trilogy, you should read “Niall and the Irish Pirates” and “Sons of Niall: The rise of Christianity in Ireland”. “I think what I love most about the book is that I could tell the author really is passionate about the history and story of Fergus the Great. I wish I was more interested in the history of my own people (I am French and German). Duffield takes the time to really do research for his book including a map and a fantastic cover. For a self-published author I think these are great details that add to the book. The first and third book covers give nods to each other and I hope in future editions the second book’s cover matches too. Interesting fact to those who may not know but Fergus the Great is the father in the Disney movie Brave! Until I read this book I had no idea the Disney character was based off a real person.” – Angies review on Goodreads September 17, 2015. Kindle ebook downloads for $ 4.99 or paperback for $ 9.99.